Two consecutive pilot-scale experiments were conducted to investigate the potential reuse of treated municipal wastewater (TWW) as an irrigation source for cultivating forage rice (Oryza sativa L., cv. Bekoaoba) through examining our newly developed continuous irrigation systems, namely surface and subirrigation. Although only P-fertilizer was applied in 2016 and no fertilizer was supplemented in the 2017 season, the obtained yields were comparable to that recorded from normal paddy fields (7.3 t ha−1). The yields of the subirrigation plots (9.1 and 7.5 t ha−1) were significantly higher than those of the surface irrigation plots (7.5 and 7.1 t ha−1) in 2016 and 2017, respectively. There was no significant difference in the protein content of brown rice between the two fields, and this content (11.6–13%) was significantly higher than that (8.8%) recorded in normal paddy fields. This indicates our harvested rice was more favorable for animal husbandry since it can reduce the use of costly protein feed such as imported soymeal. Accumulation of heavy metals was not found in either paddy soil or brown rice after the two experiments. An effective N removal efficiency of the examined irrigation systems along with the reduced usage of chemical fertilizers could contribute to a substantial decrease in nutrients discharged from the wastewater treatment plants into surface water bodies. 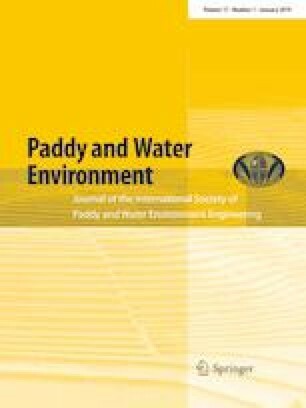 This study conveys the high feasibility of continuous irrigation with TWW to achieve high production and good nutritional quality of rice for animal feeding, which could promote an effective reuse of TWW in forage rice cultivation and enhance the self-sufficient feed ratio for sustainable dairy farming in Japan. This study was supported by the Ministry of Land, Infrastructure, Transport and Tourism (MLIT) of Japan through the Gesuido Academic Incubation to Advanced (GAIA) project, by the Ministry of Education, Sports, Culture, Science and Technology (MEXT) of Japan through the Center of Community (COC) project. This study was conducted as the collaboration with Sewerage Works Division, Tsuruoka City Government, Japan.